We are delighted to announce our Chaka 3rd Birthday which will be taking place at Havana on Saturday 23rd November featuring one of the biggest names in drum and bass at the moment, a man who absolutely smashed it over here on his last visit and since then has had some of the biggest selling singles in drum and bass. 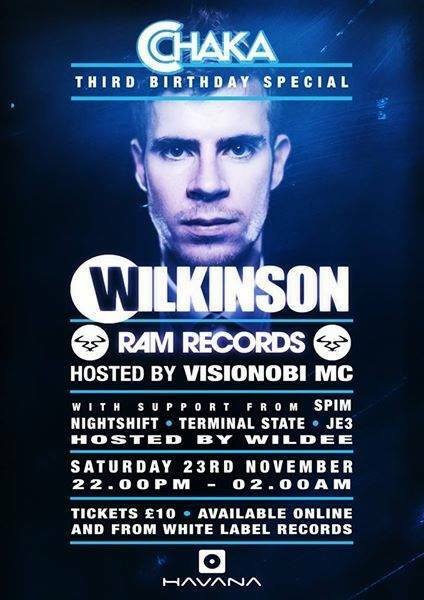 Wilkinson’s new single ‘Afterglow’ is one of the biggest dancefloor anthems of the year and is expected to storm the charts over the next few weeks. Seeing as it’s our 3rd BIrthday we’ve got a bumper support lineup featuring JE3, Nightshift, Terminal State and our resident MC…. Wildee. Joining the regulars on the night is local legend Spim, one of the finest DJs this island has ever produced! Drum and bass returns to Havana and it is going to be absolutely bouncing! Do not miss out. Limited tickets available for this event from White Label Records and also available online in the next week. Tickets are priced at £10.